If you’re like most Americans, you spend a good chunk of your waking hours at work. While many companies use regular cleaning services, the cleaning that actually gets done is usually minimal, with a quick sweep under the rug and emptying of the garbage. Increase productivity among employees. Studies have shown that employees are more focused on their work and have a higher sense of well-being when their workplace is clean and the air is free from accumulated dust in the office. Fewer sick days. 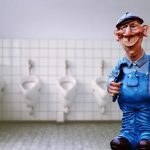 Meticulous janitorial cleaning is a key aspect in averting the expansion of disease, and their team will ensure that the business is thoroughly cleaned from top to bottom. Have a healthier work environment. The deep cleaning performed by their professional janitors will leave your building free of dust, bacteria and debris, promoting a healthy setting for all to work in. Save costs down the road. Lingering dust weathers shelves, desks, furniture, and so on. With regular business cleaning services to upkeep your goods, your appliances and furniture will last longer. Not each and every professional cleaning company performs at the same level of quality. With Prestige Building Maintenance of Nevada, you can rest assured knowing that their janitors will leave your building looking spotless and feeling fresh. They specialize in everything from sanitation to commercial window cleaning, and with over three and a half decades of experience, they know how to exceed in each aspect of industrial cleaning services. If you are in search of an affordable, reliable commercial cleaning company in the area, look no further and give them a call today at (775) 742-0777. Prestige Building Maintenance of Nevada reached out to Creactive while looking for a digital marketing agency in Reno, NV and the surrounding 40-mile radius.